Click here to see video footage of the 2010 Top 50. 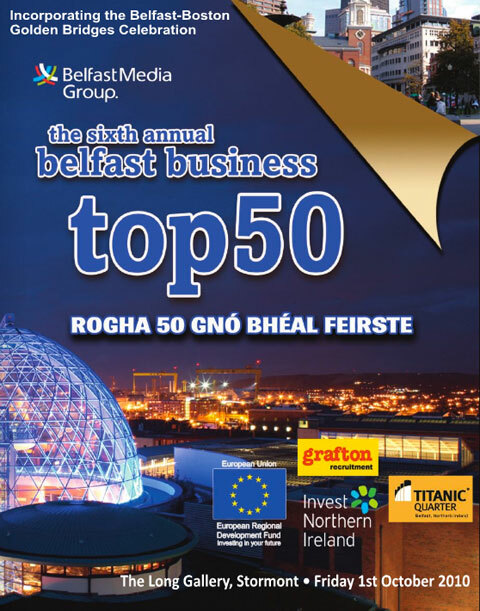 You wouldn’t really like to go through a year like the one we’ve just seen since we last met at Stormont to toast our Top 50 Belfast Businesses. But the turbulent economic times have certainly been character-forming and those companies – big and small, private sector and social economy – which made it on to this select list can be proud of their accomplishments. We’re especially pleased to be rolling out the red carpet for our Boston business and political visitors at the sixth annual Stormont luncheon on Friday, October 1 – where DSD Minister Alex Attwood will do the honours – who are being led by Brad Waugh, CEO of global giant NaviNet, and Rep. Charles Murphy, Chair of the Ways and Means Committee in the House of Representatives, Massachusetts. Our thanks to to our premier sponsors, Grafton Recruitment and Invest NI, and to Delta Print and Titanic Quarter for making this celebration possible, and of course for Jennifer McCann and Basil McCrea of the Enterprise, Trade and Investment Committee in the Assembly, who have opened the House on the Hill for this unique gathering. Go n-éirí go geal le gach duine dár gcaoga – May all our Top 50 continue to go from strength to strength in the time ahead.